It isn't often that a large city newspaper devotes half a page to an article on genealogy, so kudos to the San Francisco Chronicle and columnist Brenda Payton for yesterday's feature about Electra Kimble Price. 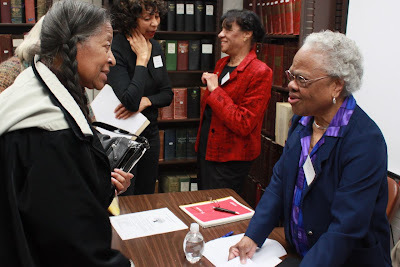 Electra Kimble Price (right) at the CGS Black Family History program in February 2010. In case you missed it, the opinion piece on African American Genealogy "Digging Deep to Uncover Roots" is a detailed look at Electra's life and work. The online version bears a slightly different title but Genealogist Digs Deep to Uncover Blacks' Roots includes every word of Brenda Payton's glowing profile and several more photographs of Price. 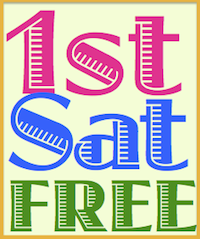 Electra has been a member of the California Genealogical Society since 1994. She is an Oakland native and a local legend among Bay Area genealogists. I had the pleasure of meeting her at her home a few years ago when she donated books to the CGS library. Price was one of the founding members of the African American Genealogical Society of Northern California (AAGSNC). She received the Distinguished Service Award of the Genealogical Society of Utah in 2000 in recognition of the countless hours she has devoted to helping family historians. Many years ago Electra started an African-American genealogy research class (now taught by Judith Collins) at the Oakland California Family History Center. Price orchestrated a Black History Month event there this past Sunday where she was feted with another award and cake. Nicka Smith's report (and gorgeous photos) can be found on the AAGSNC blog Black Family History Day was a Success! Photograph courtesy of Nicka Smith, 2/20/2010, Oakland, California.